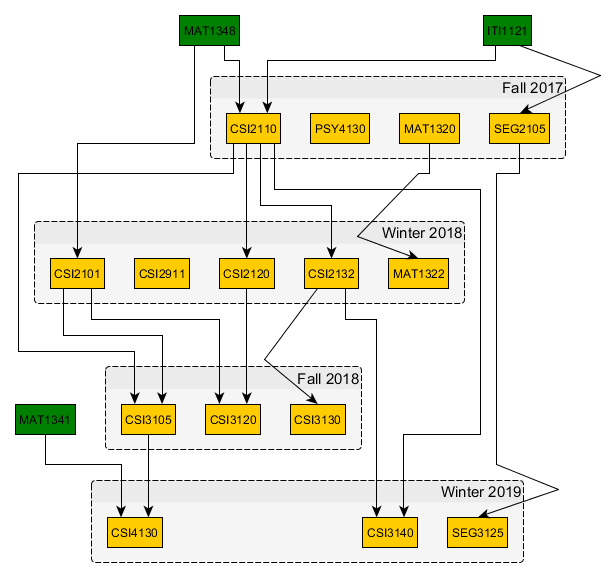 In this article, I try to visualize the last four semesters in my degree as a directed graph with courses as nodes and prerequisite relations as edges. Will my plan work, or am I missing prerequisites? NetworkX and yEd are used for creating and displaying the graph. I want to graduate in at least two years which means I need to pass a certain set of courses in a specific sequence. Not all courses are available every semester; certain courses can only be taken in the Fall term, others only in the Winter. Many courses have prerequisites, often the prerequisites have prerequisites. There are electives and a large library of possibilities. The course catalogue. Contains most of the information I want, except for scheduling and availability. No search engine, so I had to look up a course code page and CTRL-F. The enrollment system. I can't link to this as it can only be accessed through "uoZone" (uOttawa's internal system). As far as I know, this is the only place where course availability and number of available seats are given. This software is atrocious. Instead of following the universally agreed-upon course code system, courses are assigned a seemingly random sequence of numbers and letters. I have 1000 other complaints, but I'll spare you the rant. After hours pouring over the program requirements and the course catalogue, I had a list of candidates and a possible schedule. But will it work? Have I missed a prerequisite or planned to take a course in the Fall that is only available in the Winter? This stuff is too complicated...I need a visual. I created a spreadsheet of all the courses I'm planning on taking and furnished it with various information about them. The most confusing aspect is the prerequisite chain, so I'd like to visualize this as a directed graph with courses as nodes and prerequisite links as edges. Each course_code will be a node in the directed graph. Nodes are linked by prerequisite relations. For example, MAT1320 -> MAT1322 (because taking Calculus II requires having already passed Calculus I). I got the prerequisites by copy/pasting from the course catalogue, but some of them have extra characters. weird_string = " ITI 1121, MAT 1348"
According to samwize on StackOverflow, \xa0 is "actually non-breaking space in Latin1 (ISO 8859-1), also chr(160)". I don't really understand what that means, but I'm guessing \xa0 is some kind of substitute for a space. In any case, keeping these characters made for ugly output so I chose to remove them. StackOverflow suggests unicodedata.normalize(). The documentation is a bit vague on what the different "forms" mean ("NFC", "NFKC", "NFD", and "NFKD") and I don't feel like researching this right now so...TRIAL AND ERROR IT IS! NFKC and NFKD look good. I'll pick the former for no good reason. Why course_formatter2()? Because I used course_formatter() before looking into the problem more closely, it worked OK. This is a bit confusing because it looks like CSI2110 -> ITI1121 (when it is the other way around). Kinda cool, but I think yEd might be better for producing a finished graphic. NetworkX can export to a lot of different formats, but I chose GraphML because yEd also supports it. This exported the nodes and edges, but the labels are missing! Google led me to this blog which had some good advice. I used yEd's "hierarchy" layout. Courses I've already taken are color coded green. There are four groups, representing the courses I intend to take for a given term. A few arrows were repositioned (by hand) to make the group labels easier to read. Taking the courses in this order should ensure prerequisites are always satisfied. CSI 2110 is a prerequisite for four courses. Failing to acquire it in the Fall of 2017 will severely screw up my schedule. PSY 4130 and CSI 2911 are not prerequisites for any course, so they can be acquired at any time. MAT 1320 and MAT 1322 are a closed system. I'm a little surprised MAT 1322 is not a prerequisite for anything. Also, I should think about how to best distribute my remaining courses. There is a chance of graduating in three terms instead of four if I can find a replacement for CSI4130 and take more courses in Fall 2018 (or over the summer). Reducing to three semesters may require taking less desirable courses but it would save me a lot of time and money. If I do end up taking four semesters, I could shift CSI 2911 to a later semester to even the course load. Or I could keep it as it is and plan to work part-time. Scholarships and government grants usually require students to be "full-time", so I can't drop below three courses (the minimum for "full-time" status at uOttawa). The biggest weakness is the lack of definite course/semester availability after Winter 2018. I am just guessing that these courses will be available during these semesters. There are other issues, but this is the main one. Data collection was disappointingly manual. The University of Ottawa simply does not provide good access to course information. Scraping is an option, but a frustrating one; the course timetable server is so old that Python's Request library cannot communicate with it  and uOttawa's HTML is not easy to parse. Manual collection is feasible, but doesn't scale and is obviously not convenient. - IRC, the issue I encountered was SSL handshake failure. The newest cipher protocol supported by the server had already been deprecated by Requests. While it was possible to use an older version of Requests, the connection was unreliable. A similar issue (similar problem, different website).